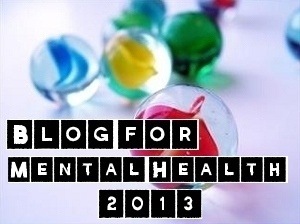 For those who have been following this blog for a while, you are familiar with some of the relational difficulties Keith and I have had and you may have seen previous postings where I’ve stated I believe we all experience difficulty with an undiagnosed mental health issue of his that I’ve identified as probably being Borderline Personality Disorder (BPD). • Marked mood swings with periods of intense depressed mood, irritability and/or anxiety lasting a few hours to a few days (but not in the context of a full-blown episode of major depressive disorder or bipolar disorder). • Inappropriate, intense or uncontrollable anger. • Recurring suicidal threats or non-suicidal self-injurious behavior, such as cutting or burning one’s self. • Unstable, intense personal relationships, sometimes alternating between “all good,” idealization, and “all bad,” devaluation. • Persistent uncertainty about self-image, long-term goals, friendships and values. • Chronic boredom or feelings of emptiness. • Frantic efforts to avoid abandonment. 1) I made the conscious decision to start finding out how to communicate in ways that a person with BPD can receive and process information. Then began acting on that information. 2) Work on acceptance and forgiveness while also working on letting go of criticism and judgment. However difficult and personally painful it is dealing with him when he acts out on his impulses, intense & irrational anger, and unstable moods, I now know and understand that he is no more the cause of what I believe to be his illness/issues than I am the cause of my depression, hypomania, and attachment disorder. No one consciously chooses to be this miserable and unstable. 3) Seek support from my peers. Since the average, “healthy” person has no context to understand my decision to stay in relationship with him and I have been subjected to harsh judgments and criticisms regarding that choice, however justified the people passing judgment and offering criticism may be, I have stopped trying to get others to understand or condone my decision. Instead, I now participate in a closed, private, online support group with other people who are or have been in relationship with someone who experiences and exhibits symptomology consistent with BPD. It is a safe place to vent, receive, and give supportive encouragement. 5) I am making conscious efforts to get out of my situational and self-imposed isolation and have committed to doing things I need to do to take care of myself and seek after ways of achieving my dreams and goals, instead of simmering in bitterness and resentment that he is limited in his ability and capacity to encourage and support me in those things. I know that by choosing to stay in relationship with him, I am choosing a more difficult path. However, the things that I value and believe inform and dictate this choice. He is committed to me and our family. He is working to provide for and support our family. He WANTS to be a father to our daughter and is doing the best he can to be the dad and husband he wants to be. 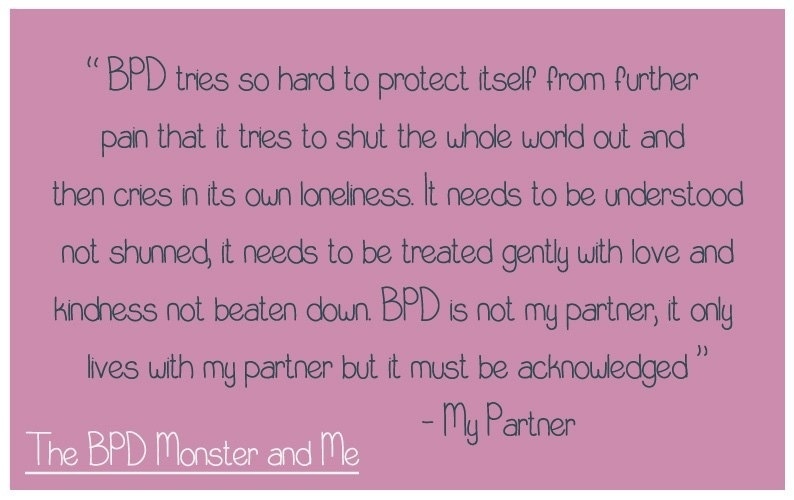 A member of my support group shared an image from the Facebook Page, The BPD Monster and Me. I want to share it with you. One of the things I have learned and come to understand as part of the healing and recovery process is that the people and relationships I wind up engaging with and having in my life are a reflection of my inner being. What this means is that however dysfunctional and damaged I believe them to be generally indicates that I have the same level of dysfuntionality and damage. The less I focus on their dysfunction and damage and the more I take my cues from their issues and am willing to see and address my own, the healthier I become. As a result, I am encountering new people and building new relationships where I am finding new and different reflections of myself. I was just settling in to visit you. Thanks for being part of my team. I’m immeasurably grateful we’re traveling the Universe together. Unified in verse, hmmm, I like it! I know from experience how challenging it can be to keep a calm about you when you are around someone with a personality disorder. You come out a better and stronger person reacting to with patience, understanding, and integrity than taking a low road of frustration and anger. You are absolutely correct. However, not understanding or really accepting that my own mental health issues were factoring in and exacerbating his, all I could see for the longest time were what I and others deemed his faults and failures. Being a person who deals with chronic depression and fibromyalgia AND being in relationship with someone exhibiting personality disorder symptoms has often been a frustrating and maddening experience. I’m grateful for the strength I’ve been gaining and my improved ability to respond constructively and compassionately to all of us. I’m glad you found this information helpful. 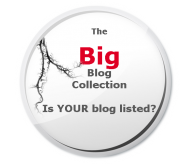 I first heard about it in 2006 when I attended a presentation by a treatment organization that specializes in Dialectical Behavior Therapy (DBT). It was presented as information for helping adolescents with self-harm behaviors and listed these symptoms and behaviors. It was like a light exploded in my head and the previous ten years of my relationship with Keith suddenly came into focus. 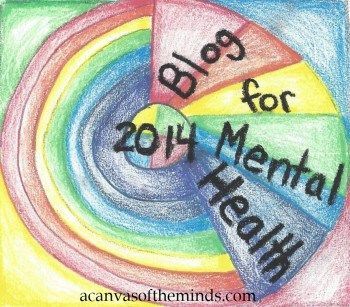 It took me another five years before I realized and faced how my own issues interacted with his and actually started researching constructive ways to deal with it. I don’t know how anyone in their right minds can think we are that way because we like it! (((Hugs))) Thank you for being here and sharing. Hugs back. And all the best to you and your family. Thank you and to you and yours!